2017’s Razer Phone revitalized the concept of a gaming smartphone, delivering that slick 120Hz display and the gaming brand’s aesthetics. We’ve seen plenty of pretenders to the throne in 2018, but there can only be one king of the gaming phones this year. To figure out this answer, we decided against using the likes of GFXBench. The benchmark tool uses frames per second (fps) as its key unit of measurement and, with the exception of the Razer Phone series, the vast majority of phones have screens that are physically capped at 60Hz. This means that they’ll never exceed the 60fps threshold, while Razer’s phones are able to do so (even if they’re not able to hold that framerate). Instead, we opted to use 3DMark as our primary gaming phone benchmark, and the results show that the ROG Phone just edged out the Xiaomi Black Shark. Asus is the only big-name manufacturer to use an overclocked Snapdragon 845 chipset this year (hitting 2.96Ghz compared to the chip’s stock 2.8Ghz speed), allowing the phone to hit higher highs compared to stock flagships. The brand also implemented a vapor chamber system to keep things cool — what’s the point of high clock speeds if the phone can’t sustain it, after all? Toss in 8GB of RAM, and 128GB or 512GB of storage, and you’ve got one of the more powerful smartphones of 2018. That’s not to say that we didn’t see better performing phones on the list, with the Galaxy S9, Galaxy S9 Plus, OnePlus 6T and Sony Xperia XZ2 edging out the ROG Phone in 3DMark. But it’s certainly the top-performing gaming smartphone on the list, as you can see in the graph above. In saying so, the benchmark shows that most these gaming phones are rather powerful, with the Honor Play in last place. But even the Honor device will cope just fine in the likes of Fortnite and PUBG. Display tech is another key battleground for any credible gaming smartphone on the market. The Razer Phone set a high bar last year, offering a 1440p LCD screen with a super-smooth 120Hz display. The higher refresh rate meant higher framerates in games that supported it. The higher refresh rate also requires more horsepower, and we never really saw supported games hit 120fps for any real length of time on the Razer device. In fact, the Razer Phone’s GFXBench T-Rex HD benchmark topped out at 78fps in our testing, while the Razer Phone 2 hit 89fps — quite a way off the 120fps cap. The ROG Phone’s panel touts a 90Hz refresh rate, allowing for smooth gameplay in supported games. Sure, it didn’t reach the same heights as the Razer Phone 2’s refresh rate, but it’s still a step above the vast majority of flagship phones. And when you pair the higher refresh rate with AMOLED screens, you’ve got a combination that’s hard to beat. As we previously noted in our best performing phones article, horsepower isn’t much of a concern between flagships these days. They all feature similar levels of power, so you’re unlikely to notice any significant real-world differences between the various flagship phones in most games (emulators might be a different story). One of the areas where the Asus ROG Phone really differentiates itself from the competition is in its wide variety of peripherals. Between a cooling fan accessory (with a headphone jack), a DeX-style dock to output to a large screen, and a Nintendo DS-style shell (complete with a screen and battery), you have plenty of options compared to rival gaming phones. Meanwhile, Xiaomi’s Black Shark only offers a gamepad. The Asus ROG Phone's star feature might be the ultrasonic trigger buttons. Even if you decide against buying accessories, the ROG Phone’s hardware features make it stand out from rival gaming devices. The phone packs two USB Type-C ports, with the second, side-mounted port being used for accessories. But the star feature might be the ultrasonic triggers along the edges of the phone. These are essentially shoulder triggers, giving sorely needed physical feedback (of sorts) during your gaming sessions. And with the ability to program these triggers to take the place of virtual keys, it certainly makes for a welcome feature in the world of gaming phones. It’s easy to be cynical any time you hear claims of a “gaming smartphone,” especially when they’re essentially a flagship phone with a garish look. But Asus went a long way to allay concerns that this was simply a cash-grab. Sure, the Razer Phone may have a 120Hz refresh rate, while the Black Shark and Honor Play are much cheaper. 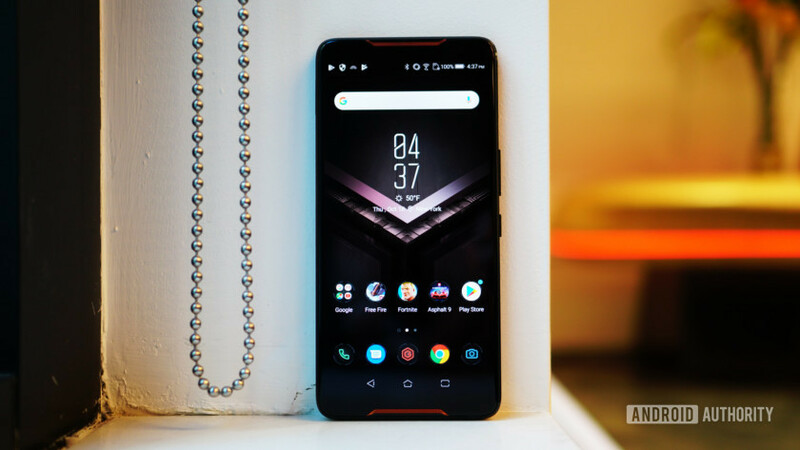 But between the overclocked internals, OLED display with a 90Hz refresh rate, ultrasonic triggers, and army of accessories, the Taiwanese company has crafted a device that stands tall above other gaming-focused phones.